The Crusades were military campaigns sanctioned by the Roman Catholic Church during the High and Late Middle Ages. The Crusades were a series of military conflicts conducted by Christian knights to defend Christians and the Christian empire against Muslim forces. The Holy Land was part of the Roman Empire until the Islamic conquests of the 7th and 8th centuries. Thereafter, Christians were permitted to visit parts of the Holy Land until 1071, when Christian pilgrimages were stopped by the Seljuq Turks. The Seljuq Turks had taken over much of Byzantium after the Byzantine defeat at the Battle of Manzikert in 1071. In 1095 at the Council of Piacenza, Byzantine Emperor Alexios I Komnenos requested military aid from Urban II to fight the Turks. In July 1095, Urban turned to his homeland of France to recruit men for the expedition. His travels there culminated in the Council of Clermont in November, where he gave speeches combining the idea of pilgrimage to the Holy Land with that of waging a holy war against infidels, which received an enthusiastic response. 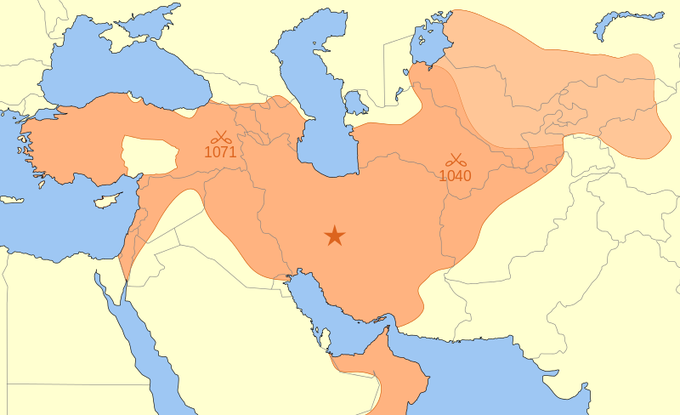 Seljuq Empire: A medieval Turko-Persian Sunni Muslim empire that controlled a vast area stretching from the Hindu Kush to eastern Anatolia and from Central Asia to the Persian Gulf. The Seljuq Turk attack on Byzantium helped spur the crusades. heretical: Relating to departure from established beliefs or customs. Byzantine Empire: The predominantly Greek-speaking continuation of the eastern half of the Roman Empire during Late Antiquity and the Middle Ages. schism: A division or a split, usually between groups belonging to a religious denomination. The Crusades were a series of military conflicts conducted by Christian knights for the defense of Christians and for the expansion of Christian domains between the 11th and 15th centuries. Generally, the Crusades refer to the campaigns in the Holy Land sponsored by the papacy against Muslim forces. There were other crusades against Islamic forces in southern Spain, southern Italy, and Sicily, as well as campaigns of Teutonic knights against pagan strongholds in Eastern Europe. A few crusades, such as the Fourth Crusade, were waged within Christendom against groups that were considered heretical and schismatic. Crusades were fought for many reasons—to capture Jerusalem, recapture Christian territory, or defend Christians in non-Christian lands; as a means of conflict resolution among Roman Catholics; for political or territorial advantage; and to combat paganism and heresy. The origin of the Crusades in general, and particularly of the First Crusade, is widely debated among historians. The confusion is partially due to the numerous armies in the First Crusade, and their lack of direct unity. The similar ideologies held the armies to similar goals, but the connections were rarely strong, and unity broke down often. The Crusades are most commonly linked to the political and social situation in 11th-century Europe, the rise of a reform movement within the papacy, and the political and religious confrontation of Christianity and Islam in Europe and the Middle East. Christianity had spread throughout Europe, Africa, and the Middle East in Late Antiquity, but by the early 8th century Christian rule had become limited to Europe and Anatolia after the Muslim conquests. The Holy Land had been part of the Roman Empire, and thus the Byzantine Empire, until the Islamic conquests. In the 7th and 8th centuries, Islam was introduced in the Arabian Peninsula by the Islamic prophet Muhammad and his followers. This formed a unified Muslim polity, which led to a rapid expansion of Arab power, the influence of which stretched from the northwest Indian subcontinent, across Central Asia, the Middle East, North Africa, southern Italy, and the Iberian Peninsula, to the Pyrenees. Tolerance, trade, and political relationships between the Arabs and the Christian states of Europe waxed and waned. For example, the Fatimid caliph al-Hakim bi-Amr Allah destroyed the Church of the Holy Sepulchre, but his successor allowed the Byzantine Empire to rebuild it. Pilgrimages by Catholics to sacred sites were permitted, resident Christians were given certain legal rights and protections under Dhimmi status, and interfaith marriages were not uncommon. Cultures and creeds coexisted and competed, but the frontier conditions became increasingly inhospitable to Catholic pilgrims and merchants. At the western edge of Europe and of Islamic expansion, the Reconquista (recapture of the Iberian Peninsula from the Muslims) was well underway by the 11th century, reaching its turning point in 1085 when Alfonso VI of León and Castile retook Toledo from Muslim rule. Increasingly in the 11th century, foreign knights, mostly from France, visited Iberia to assist the Christians in their efforts. The heart of Western Europe had been stabilized after the Christianization of the Saxon, Viking, and Hungarian peoples by the end of the 10th century. However, the breakdown of the Carolingian Empire gave rise to an entire class of warriors who now had little to do but fight among themselves. The random violence of the knightly class was regularly condemned by the church, and so it established the Peace and Truce of God to prohibit fighting on certain days of the year. At the same time, the reform-minded papacy came into conflict with the Holy Roman Emperors, resulting in the Investiture Controversy. The papacy began to assert its independence from secular rulers, marshaling arguments for the proper use of armed force by Catholics. Popes such as Gregory VII justified the subsequent warfare against the emperor’s partisans in theological terms. It became acceptable for the pope to utilize knights in the name of Christendom, not only against political enemies of the papacy, but also against Al-Andalus, or, theoretically, against the Seljuq dynasty in the east. The result was intense piety, an interest in religious affairs, and religious propaganda advocating a just war to reclaim Palestine from the Muslims. Participation in such a war was seen as a form of penance that could counterbalance sin. To the east of Europe lay the Byzantine Empire, composed of Christians who had long followed a separate Orthodox rite; the Eastern Orthodox and Roman Catholic churches had been in schism since 1054. Historians have argued that the desire to impose Roman church authority in the east may have been one of the goals of the Crusades, although Urban II, who launched the First Crusade, never refers to such a goal in his letters on crusading. The Seljuq Empire had taken over almost all of Anatolia after the Byzantine defeat at the Battle of Manzikert in 1071; however, their conquests were piecemeal and led by semi-independent warlords, rather than by the sultan. A dramatic collapse of the empire’s position on the eve of the Council of Clermont brought Byzantium to the brink of disaster. By the mid-1090s, the Byzantine Empire was largely confined to Balkan Europe and the northwestern fringe of Anatolia, and faced Norman enemies in the west as well as Turks in the east. In response to the defeat at Manzikert and subsequent Byzantine losses in Anatolia in 1074, Pope Gregory VII had called for the milites Christi (“soldiers of Christ”) to go to Byzantium’s aid. Seljuq Empire: The Great Seljuq Empire at its greatest extent (1092). While the Crusades had causes deeply rooted in the social and political situations of 11th-century Europe, the event actually triggering the First Crusade was a request for assistance from Byzantine emperor Alexios I Komnenos. Alexios was worried about the advances of the Seljuqs, who had reached as far west as Nicaea, not far from Constantinople. In March 1095, Alexios sent envoys to the Council of Piacenza to ask Pope Urban II for aid against the Turks. Urban responded favorably, perhaps hoping to heal the Great Schism of forty years earlier, and to reunite the Church under papal primacy by helping the eastern churches in their time of need. Alexios and Urban had previously been in close contact in 1089 and later, and had openly discussed the prospect of the (re)union of the Christian church. There were signs of considerable co-operation between Rome and Constantinople in the years immediately before the Crusade. In July 1095, Urban turned to his homeland of France to recruit men for the expedition. His travels there culminated in the Council of Clermont in November, where, according to the various speeches attributed to him, he gave an impassioned sermon to a large audience of French nobles and clergy, graphically detailing the fantastical atrocities being committed against pilgrims and eastern Christians. Urban talked about the violence of European society and the necessity of maintaining the Peace of God; about helping the Greeks, who had asked for assistance; about the crimes being committed against Christians in the east; and about a new kind of war, an armed pilgrimage, and of rewards in heaven, where remission of sins was offered to any who might die in the undertaking. Combining the idea of pilgrimage to the Holy Land with that of waging a holy war against infidels, Urban received an enthusiastic response to his speeches and soon after began collecting military forces to begin the First Crusade. Council of Clermont: Pope Urban II at the Council of Clermont, where he gave speeches in favor of a Crusade. The First Crusade (1095–1099) was a military expedition by Roman Catholic Europe to regain the Holy Lands taken in Muslim conquests, ultimately resulting in the recapture of Jerusalem. The First Crusade (1095–1099), called for by Pope Urban II, was the first of a number of crusades that attempted to recapture the Holy Lands. It was launched on November 27, 1095, by Pope Urban II with the primary goal of responding to an appeal from Byzantine Emperor Alexios I Komnenos, who had been defeated by Turkish forces. An additional goal soon became the principal objective—the Christian reconquest of the sacred city of Jerusalem and the Holy Land and the freeing of the Eastern Christians from Muslim rule. The first object of the campaign was Nicaea, previously a city under Byzantine rule, which the Crusaders captured on June 18, 1097, by defeating the troops of Kilij Arslan. After marching through the Mediterranean region, the Crusaders arrived at Jerusalem, launched an assault on the city, and captured it in July 1099, massacring many of the city’s Muslim and Jewish inhabitants. In the end, they established the crusader states of the Kingdom of Jerusalem, the County of Tripoli, the Principality of Antioch, and the County of Edessa. Church of the Holy Sepulchre: A church within the Christian Quarter of the Old City of Jerusalem that contains, according to traditions dating back to at least the 4th century, the two holiest sites in Christendom—the site where Jesus of Nazareth was crucified and Jesus’s empty tomb, where he is said to have been buried and resurrected. Pope Urban II: Pope from March 12, 1088, to his death in 1099, he is best known for initiating the First Crusade. People’s Crusade: An expedition seen as the prelude to the First Crusade that lasted roughly six months, from April to October 1096, and was led mostly by peasants. Alexios I Komnenos: Byzantine emperor from 1081 to 1118, whose appeals to Western Europe for help against the Turks were also the catalyst that likely contributed to the convoking of the Crusades. The First Crusade (1095–1099), called for by Pope Urban II, was the first of a number of crusades intended to recapture the Holy Lands. It started as a widespread pilgrimage in western Christendom and ended as a military expedition by Roman Catholic Europe to regain the Holy Lands taken in the Muslim conquests of the Mediterranean (632–661), ultimately resulting in the recapture of Jerusalem in 1099. It was launched on November 27, 1095, by Pope Urban II with the primary goal of responding to an appeal from Byzantine Emperor Alexios I Komnenos, who requested that western volunteers come to his aid and help to repel the invading Seljuq Turks from Anatolia (modern-day Turkey). An additional goal soon became the principal objective—the Christian reconquest of the sacred city of Jerusalem and the Holy Land and the freeing of the Eastern Christians from Muslim rule. During the crusade, knights, peasants, and serfs from many regions of Western Europe travelled over land and by sea, first to Constantinople and then on toward Jerusalem. The Crusaders arrived at Jerusalem, launched an assault on the city, and captured it in July 1099, massacring many of the city’s Muslim and Jewish inhabitants. They also established the crusader states of the Kingdom of Jerusalem, the County of Tripoli, the Principality of Antioch, and the County of Edessa. Pope Urban II planned the departure of the crusade for August 15, 1096; before this, a number of unexpected bands of peasants and low-ranking knights organized and set off for Jerusalem on their own, on an expedition known as the People’s Crusade, led by a monk named Peter the Hermit. The peasant population had been afflicted by drought, famine, and disease for many years before 1096, and some of them seem to have envisioned the crusade as an escape from these hardships. Spurring them on had been a number of meteorological occurrences beginning in 1095 that seemed to be a divine blessing for the movement—a meteor shower, an aurorae, a lunar eclipse, and a comet, among other events. An outbreak of ergotism had also occurred just before the Council of Clermont. Millenarianism, the belief that the end of the world was imminent, widespread in the early 11th century, experienced a resurgence in popularity. The response was beyond expectations; while Urban might have expected a few thousand knights, he ended up with a migration numbering up to 40,000 Crusaders of mostly unskilled fighters, including women and children. Lacking military discipline in what likely seemed a strange land (Eastern Europe), Peter’s fledgling army quickly found itself in trouble despite the fact that they were still in Christian territory. This unruly mob began to attack and pillage outside Constantinople in search of supplies and food, prompting Alexios to hurriedly ferry the gathering across the Bosporus one week later. After crossing into Asia Minor, the crusaders split up and began to plunder the countryside, wandering into Seljuq territory around Nicaea, where they were massacred by an overwhelming group of Turks. People’s Crusade massacre: An illustration showing the defeat of the People’s Crusade by the Turks. The four main Crusader armies left Europe around the appointed time in August 1096. They took different paths to Constantinople and gathered outside the city walls between November 1096 and April 1097; Hugh of Vermandois arrived first, followed by Godfrey, Raymond, and Bohemond. This time, Emperor Alexios was more prepared for the Crusaders; there were fewer incidents of violence along the way. The Crusaders may have expected Alexios to become their leader, but he had no interest in joining them, and was mainly concerned with transporting them into Asia Minor as quickly as possible. In return for food and supplies, Alexios requested that the leaders to swear fealty to him and promise to return to the Byzantine Empire any land recovered from the Turks. Before ensuring that the various armies were shuttled across the Bosporus, Alexios advised the leaders on how best to deal with the Seljuq armies they would soon encounter. The Crusader armies crossed over into Asia Minor during the first half of 1097, where they were joined by Peter the Hermit and the remainder of his little army. Alexios also sent two of his own generals, Manuel Boutoumites and Tatikios, to assist the Crusaders. The first object of their campaign was Nicaea, previously a city under Byzantine rule, but which had become the capital of the Seljuq Sultanate of Rum under Kilij Arslan I. Arslan was away campaigning against the Danishmends in central Anatolia at the time, and had left behind his treasury and his family, underestimating the strength of these new Crusaders. Subsequently, upon the Crusaders’ arrival, the city was subjected to a lengthy siege, and when Arslan had word of it he rushed back to Nicaea and attacked the Crusader army on May 16. He was driven back by the unexpectedly large Crusader force, with heavy losses suffered on both sides in the ensuing battle. The siege continued, but the Crusaders had little success as they found they could not blockade Lake Iznik, which the city was situated on, and from which it could be provisioned. To break the city, Alexios had the Crusaders’ ships rolled over land on logs, and at the sight of them the Turkish garrison finally surrendered, 18 June 18. The city was handed over to the Byzantine troops. At the end of June, the Crusaders marched on through Anatolia. They were accompanied by some Byzantine troops under Tatikios, and still harbored the hope that Alexios would send a full Byzantine army after them. After a battle with Kilij Arslan, the Crusaders marched through Anatolia unopposed, but the journey was unpleasant, as Arslan had burned and destroyed everything he left behind in his army’s flight. It was the middle of summer, and the Crusaders had very little food and water; many men and horses died. Fellow Christians sometimes gave them gifts of food and money, but more often than not the Crusaders simply looted and pillaged whenever the opportunity presented itself. Proceeding down the Mediterranean coast, the crusaders encountered little resistance, as local rulers preferred to make peace with them and furnish them with supplies rather than fight. On June 7, the Crusaders reached Jerusalem, which had been recaptured from the Seljuqs by the Fatimids only the year before. Many Crusaders wept upon seeing the city they had journeyed so long to reach. The arrival at Jerusalem revealed an arid countryside, lacking in water or food supplies. Here there was no prospect of relief, even as they feared an imminent attack by the local Fatimid rulers. The Crusaders resolved to take the city by assault. They might have been left with little choice, as it has been estimated that only about 12,000 men, including 1,500 cavalry, remained by the time the army reached Jerusalem. After the failure of the initial assault, a meeting between the various leaders was organized in which it was agreed upon that a more concerted attack would be required in the future. On June 17, a party of Genoese mariners under Guglielmo Embriaco arrived at Jaffa and provided the Crusaders with skilled engineers, and perhaps more critically, supplies of timber (cannibalized from the ships) with which to build siege engines. The Crusaders’ morale was raised when a priest, Peter Desiderius, claimed to have had a divine vision of Bishop Adhemar instructing them to fast and then march in a barefoot procession around the city walls, after which the city would fall, following the Biblical story of Joshua at the siege of Jericho. The final assault on Jerusalem began on July 13; Raymond’s troops attacked the south gate while the other contingents attacked the northern wall. Initially the Provençals at the southern gate made little headway, but the contingents at the northern wall fared better, with a slow but steady attrition of the defense. On July 15, a final push was launched at both ends of the city, and eventually the inner rampart of the northern wall was captured. In the ensuing panic, the defenders abandoned the walls of the city at both ends, allowing the Crusaders to finally enter. Capture of Jerusalem: A depiction of the capture of Jerusalem in 1099 from a medieval manuscript. The burning buildings of Jerusalem are centered in the image. The various Crusaders are surrounding and besieging the village armed for an attack. The massacre that followed the capture of Jerusalem has attained particular notoriety, as a “juxtaposition of extreme violence and anguished faith.” The eyewitness accounts from the Crusaders themselves leave little doubt that there was a great slaughter in the aftermath of the siege. Nevertheless, some historians propose that the scale of the massacre was exaggerated in later medieval sources. The slaughter lasted a day; Muslims were indiscriminately killed, and Jews who had taken refuge in their synagogue died when it was burnt down by the Crusaders. The following day, Tancred’s prisoners in the mosque were slaughtered. Still, it is clear that some Muslims and Jews of the city survived the massacre, either escaping or being taken prisoner to be ransomed. The Eastern Christian population of the city had been expelled before the siege by the governor, and thus escaped the massacre. On July 22, a council was held in the Church of the Holy Sepulchre to establish a king for the newly created Kingdom of Jerusalem. Raymond IV of Toulouse and Godfrey of Bouillon were recognized as the leaders of the crusade and the siege of Jerusalem. Raymond was the wealthier and more powerful of the two, but at first he refused to become king, perhaps attempting to show his piety and probably hoping that the other nobles would insist upon his election anyway. The more popular Godfrey did not hesitate like Raymond, and accepted a position as secular leader. Having captured Jerusalem and the Church of the Holy Sepulchre, the Crusaders had fulfilled their vow. The Second Crusade (1147–1149) was the second major crusade launched against Islam by Catholic Europe, started in response to the fall of the County of Edessa founded in the First Crusade; it was largely a failure for the Europeans. The Second Crusade was started in 1147 in response to the fall of the County of Edessa the previous year to the forces of Zengi; Edessa was founded during the First Crusade. The Second Crusade was led by two European kings— Louis VII of France and Conrad III of Germany. The German and French armies took separate routes to Anatolia, fighting skirmishes along the way, and both were defeated separately by the Seljuq Turks. Louis and Conrad and the remnants of their armies eventually reached Jerusalem and participated in an ill-advised attack on Damascus in 1148. The Second Crusade was a failure for the Crusaders and a great victory for the Muslims. Moors: The Muslim inhabitants of the Maghreb, North Africa and the Iberian Peninsula, Sicily, and Malta during the Middle Ages, who initially were Berber and Arab peoples of North African descent. Conrad III: First German king of the Hohenstaufen dynasty, who led troops in the Second Crusade. Manuel I Komneno: A Byzantine Emperor of the 12th century who reigned over a crucial turning point in the history of Byzantium and the Mediterranean, including the Second Crusade. Louis VII: A Capetian king of the Franks from 1137 until his death who led troops in the Second Crusade. The Second Crusade (1147–1149) was the second major crusade launched from Europe as a Catholic holy war against Islam. The Second Crusade was started in 1147 in response to the fall of the County of Edessa the previous year to the forces of Zengi. The county had been founded during the First Crusade by King Baldwin of Boulogne in 1098. While it was the first Crusader state to be founded, it was also the first to fall. The Second Crusade was announced by Pope Eugene III, and was the first of the crusades to be led by European kings, namely Louis VII of France and Conrad III of Germany, who had help from a number of other European nobles. The armies of the two kings marched separately across Europe. After crossing Byzantine territory into Anatolia, both armies were separately defeated by the Seljuq Turks. The main Western Christian source, Odo of Deuil, and Syriac Christian sources claim that the Byzantine Emperor Manuel I Komnenos secretly hindered the Crusaders’ progress, particularly in Anatolia, where he is alleged to have deliberately ordered Turks to attack them. Louis and Conrad and the remnants of their armies reached Jerusalem and participated in an ill-advised attack on Damascus in 1148. The Crusade in the east was a failure for the Crusaders and a great victory for the Muslims. It would ultimately have a key influence on the fall of Jerusalem and give rise to the Third Crusade at the end of the 12th century. The only Christian success of the Second Crusade came to a combined force of 13,000 Flemish, Frisian, Norman, English, Scottish, and German Crusaders in 1147. Traveling by ship from England to the Holy Land, the army stopped and helped the smaller (7,000) Portuguese army capture Lisbon, expelling its Moorish occupants. Joscelin II had tried to take back Edessa, but Nur ad-Din defeated him in November 1146. On February 16, 1147, the French Crusaders met to discuss their route. The Germans had already decided to travel overland through Hungary, as the sea route was politically impractical because Roger II, king of Sicily, was an enemy of Conrad. Many of the French nobles distrusted the land route, which would take them through the Byzantine Empire, the reputation of which still suffered from the accounts of the First Crusaders. Nevertheless, it was decided to follow Conrad, and to set out on June 15. The German crusaders, accompanied by the papal legate and Cardinal Theodwin, intended to meet the French in Constantinople. Ottokar III of Styria joined Conrad at Vienna, and Conrad’s enemy Géza II of Hungary allowed them to pass through unharmed. When the German army of 20,000 men arrived in Byzantine territory, Emperor Manuel I Komnenos feared they were going to attack him, and Byzantine troops were posted to ensure that there was no trouble. On September 10, the Germans arrived at Constantinople, where relations with Manuel were poor. There was a battle, after which the Germans were convinced that they should cross into Asia Minor as quickly as possible. In Asia Minor, Conrad decided not to wait for the French, and marched towards Iconium, capital of the Seljuq Sultanate of Rûm. Conrad split his army into two divisions. The authority of the Byzantine Empire in the western provinces of Asia Minor was more nominal than real, with much of the provinces being a no-man’s land controlled by Turkish nomads. Conrad underestimated the length of the march against Anatolia, and anyhow assumed that the authority of Emperor Manuel was greater in Anatolia than was in fact the case. Conrad took the knights and the best troops with him to march overland and sent the camp followers with Otto of Freising to follow the coastal road. The king’s contingent was almost totally destroyed by the Seljuqs on October 25, 1147, at the second Battle of Dorylaeum. The French crusaders departed from Metz in June 1147, led by Louis, Thierry of Alsace, Renaut I of Bar, Amadeus III, Count of Savoy and his half-brother William V of Montferrat, William VII of Auvergne, and others, along with armies from Lorraine, Brittany, Burgundy, and Aquitaine. A force from Provence, led by Alphonse of Toulouse, chose to wait until August and cross by sea. At Worms, Louis joined with crusaders from Normandy and England. They followed Conrad’s route fairly peacefully, although Louis came into conflict with King Geza of Hungary when Geza discovered Louis had allowed an attempted Hungarian usurper to join his army. Relations within Byzantine territory were grim, and the Lorrainers, who had marched ahead of the rest of the French, also came into conflict with the slower Germans whom they met on the way. The French met the remnants of Conrad’s army at Lopadion, and Conrad joined Louis’s force. They followed Otto of Freising’s route, moving closer to the Mediterranean coast, and they arrived at Ephesus in December, where they learned that the Turks were preparing to attack them. Manuel had sent ambassadors complaining about the pillaging and plundering that Louis had done along the way, and there was no guarantee that the Byzantines would assist them against the Turks. Meanwhile, Conrad fell sick and returned to Constantinople, where Manuel attended to him personally, and Louis, paying no attention to the warnings of a Turkish attack, marched out from Ephesus with the French and German survivors. The Turks were indeed waiting to attack, but in a small battle outside Ephesus, the French and Germans were victorious. They reached Laodicea on the Lycus early in January 1148, around the same time Otto of Freising’s army had been destroyed in the same area. After resuming the march, the vanguard under Amadeus of Savoy was separated from the rest of the army at Mount Cadmus, and Louis’s troops suffered heavy losses from the Turks. After being delayed for a month by storms, most of the promised ships from Provence did not arrive at all. Louis and his associates claimed the ships that did make it for themselves, while the rest of the army had to resume the long march to Antioch. The army was almost entirely destroyed, either by the Turks or by sickness. The remains of the German and French armies eventually continued on to Jerusalem, where they planned an attack on the Muslim forces in Damascus. The Crusaders decided to attack Damascus from the west, where orchards would provide them with a constant food supply. They arrived at Daraiya on July 23. The following day, the well-prepared Muslims constantly attacked the army advancing through the orchards outside Damascus. The defenders had sought help from Saif ad-Din Ghazi I of Mosul and Nur ad-Din of Aleppo, who personally led an attack on the Crusader camp. The Crusaders were pushed back from the walls into the orchards, where they were prone to ambushes and guerrilla attacks. According to William of Tyre, on July 27 the Crusaders decided to move to the plain on the eastern side of the city, which was less heavily fortified, but also had much less food and water. Some records indicate that Unur had bribed the leaders to move to a less defensible position, and that Unur had promised to break off his alliance with Nur ad-Din if the Crusaders went home. Meanwhile, Nur ad-Din and Saif ad-Din had by now arrived. With Nur ad-Din in the field it was impossible for the Crusaders to return to their better position. The local Crusader lords refused to carry on with the siege, and the three kings had no choice but to abandon the city. First Conrad, then the rest of the army, decided to retreat to Jerusalem on July 28, and they were followed the whole way by Turkish archers, who constantly harassed them. Siege of Damascus: A print of the Siege of Damascus. Each of the Christian forces felt betrayed by the other. In Germany, the Crusade was seen as a huge debacle, with many monks writing that it could only have been the work of the Devil. Despite the distaste for the memory of the Second Crusade, the experience had notable impact on German literature, with many epic poems of the late 12th century featuring battle scenes clearly inspired by the fighting in the crusade. The cultural impact of the Second Crusade was even greater in France. Unlike Conrad, the Louis’s image was improved by the crusade, with many of the French seeing him as a suffering pilgrim king who quietly bore God’s punishments. Relations between the Eastern Roman Empire and the French were badly damaged by the Second Crusade. Louis and other French leaders openly accused Emperor Manuel I of colluding with Turkish attackers during the march across Asia Minor. The memory of the Second Crusade was to color French views of the Byzantines for the rest of the 12th and 13th centuries. The Third Crusade (1189–1192) was an attempt by European leaders to reconquer the Holy Land from the Muslim sultan Saladin; it resulted in the capture of the important cities Acre and Jaffa, but failed to capture Jerusalem, the main motivation of the crusade. After the failure of the Second Crusade, the Zengid dynasty controlled a unified Syria and engaged in a successful conflict with the Fatimid rulers of Egypt; the Egyptian and Syrian forces were ultimately unified under Saladin, who employed them to reduce the Christian states and recapture Jerusalem in 1187. The Crusaders, mainly under the leadership of King Richard of England, captured Acre and Jaffa on their way to Jerusalem. Because of conflict with King Richard and to settle succession disputes, the German and French armies left the crusade early, weakening the Christian forces. After trying to overtake Jerusalem and having Jaffa change hands several times, Richard and Saladin finalized a treaty granting Muslim control over Jerusalem but allowing unarmed Christian pilgrims and merchants to visit the city. The Third Crusade differed from the First Crusade in several ways: kings led the armies into battle, it was in response to European losses, and it resulted in a treaty. Richard the Lionheart: King of England from July 6, 1189, until his death; famous for his reputation as a great military leader and warrior. Saladin: The first sultan of Egypt and Syria and the founder of the Ayyubid dynasty; he led the Muslim military campaign against the Crusader states in the Levant. The Third Crusade (1189–1192), also known as The Kings’ Crusade, was an attempt by European leaders to reconquer the Holy Land from Saladin. The campaign was largely successful, capturing the important cities of Acre and Jaffa, and reversing most of Saladin’s conquests, but it failed to capture Jerusalem, the emotional and spiritual motivation of the crusade. After the failure of the Second Crusade, the Zengid dynasty controlled a unified Syria and engaged in a conflict with the Fatimid rulers of Egypt. The Egyptian and Syrian forces were ultimately unified under Saladin, who employed them to reduce the Christian states and recapture Jerusalem in 1187. Spurred by religious zeal, King Henry II of England and King Philip II of France (known as Philip Augustus) ended their conflict with each other to lead a new crusade. The death of Henry in 1189, however, meant the English contingent came under the command of his successor, King Richard I of England (known as Richard the Lionheart). The elderly Holy Roman Emperor Frederick Barbarossa also responded to the call to arms, leading a massive army across Anatolia, but he drowned in a river in Asia Minor on June 10, 1190, before reaching the Holy Land. His death caused tremendous grief among the German Crusaders, and most of his troops returned home. After the Crusaders had driven the Muslims from Acre, Philip and Frederick’s successor, Leopold V, Duke of Austria (known as Leopold the Virtuous), left the Holy Land in August 1191. On September 2, 1192, Richard and Saladin finalized a treaty granting Muslim control over Jerusalem but allowing unarmed Christian pilgrims and merchants to visit the city. Richard departed the Holy Land on October 2. The successes of the Third Crusade allowed the Crusaders to maintain considerable states in Cyprus and on the Syrian coast. However, the failure to recapture Jerusalem would lead to the Fourth Crusade. One of the major differences between the First and Third Crusades is that by the time of the Third Crusade, and to a certain degree during the Second, the Muslim opponents had unified under a single powerful leader. At the time of the First Crusade, the Middle East was severely divided by warring rulers. Without a unified front opposing them, the Christian troops were able to conquer Jerusalem, as well as the other Crusader states. But under the powerful force of the Seljuq Turks during the Second Crusade and the even more unified power of Saladin during the Third, the Europeans were unable to achieve their ultimate aim of holding Jerusalem. After the failure of the Second Crusade, Nur ad-Din Zangi had control of Damascus and a unified Syria. Nur ad-Din also took over Egypt through an alliance, and appointed Saladin the sultan of these territories. After Nur ad-Din’s death, Saladin also took over Acre and Jerusalem, thereby wresting control of Palestine from the Crusaders, who had conquered the area 88 years earlier. Pope Urban III is said to have collapsed and died upon hearing this news, but it is not actually feasible that tidings of the fall of Jerusalem could have reached him by the time he died, although he did know of the battle of Hattin and the fall of Acre. Saladin’s Conquest (1174-1189): Map of Saladin’s Conquest into the Levant, including invasions routes, major conflicts, strongholds, and occupations. The Siege of Acre was one of the first confrontations of the Third Crusade, and a key victory for the Crusaders but a serious defeat for Saladin, who had hoped to destroy the whole of the Crusader kingdom. Richard arrived at Acre on June 8, 1191, and immediately began supervising the construction of siege weapons to assault the city, which was captured on July 12. Richard, Philip, and Leopold quarreled over the spoils of the victory. Richard cast down the German flag from the city, slighting Leopold. The rest of the German army returned home. On July 31, Philip also returned home, to settle the succession in Vermandois and Flanders, and Richard was left in sole charge of the Christian expeditionary forces. As in the Second Crusade, these disagreements and divisions within the European armies led to a weakening of the Christian forces. Siege of Acre: The Siege of Acre was the first major confrontation of the Third Crusade. After the capture of Acre, Richard decided to march to the city of Jaffa. Control of Jaffa was necessary before an attack on Jerusalem could be attempted. On September 7, 1191, however, Saladin attacked Richard’s army at Arsuf, thirty miles north of Jaffa. Richard then ordered a general counterattack, which won the battle. Arsuf was an important victory. The Muslim army was not destroyed, despite the considerable casualties it suffered, but it was scattered; this was considered shameful by the Muslims and boosted the morale of the Crusaders. Richard was able to take, defend, and hold Jaffa, a strategically crucial move toward securing Jerusalem. By depriving Saladin of the coast, Richard seriously threatened his hold on Jerusalem. Following his victory at Arsuf, Richard took Jaffa and established his new headquarters there. In November 1191 the Crusader army advanced inland toward Jerusalem. On December 12 Saladin was forced by pressure from his emirs to disband the greater part of his army. Learning this, Richard pushed his army forward, spending Christmas at Latrun. The army then marched to Beit Nuba, only twelve miles from Jerusalem. Muslim morale in Jerusalem was so low that the arrival of the Crusaders would probably have caused the city to fall quickly. Appallingly bad weather—cold with heavy rain and hailstorms—combined with fear that if the Crusader army besieged Jerusalem it might be trapped by a relieving force, led to the decision to retreat back to the coast. In July 1192, Saladin’s army suddenly attacked and captured Jaffa with thousands of men. Richard was intending to return to England when he heard the news that Saladin and his army had captured Jaffa. Richard and a small force of little more than 2,000 men went to Jaffa by sea in a surprise attack. They stormed Jaffa from their ships and the Ayyubids, who had been unprepared for a naval attack, were driven from the city. On September 2, 1192, following his defeat at Jaffa, Saladin was forced to finalize a treaty with Richard providing that Jerusalem would remain under Muslim control, but allowing unarmed Christian pilgrims and traders to visit the city. The city of Ascalon was a contentious issue, as it threatened communication between Saladin’s dominions in Egypt and Syria; it was eventually agreed that Ascalon, with its defenses demolished, be returned to Saladin’s control. Richard departed the Holy Land on October 9, 1192. Neither side was entirely satisfied with the results of the war. Though Richard’s victories had deprived the Muslims of important coastal territories and re-established a viable Frankish state in Palestine, many Christians in the Latin West felt disappointed that Richard had elected not to pursue the recapture of Jerusalem. Likewise, many in the Islamic world felt disturbed that Saladin had failed to drive the Christians out of Syria and Palestine. However, trade flourished throughout the Middle East and in port cities along the Mediterranean coastline. The motivations and results of the Third Crusade differed from those of the First in several ways. Many historians contend that the motivations for the Third Crusade were more political than religious, thereby giving rise to the disagreements between the German, French, and English armies throughout the crusade. By the end, only Richard of England was left, and his small force was unable to finally overtake Saladin, despite successes at Acre and Jaffa. This infighting severely weakened the power of the European forces. In addition, unlike the First Crusade, in the Second and Third Crusades kings led Crusaders into battle. The presence of European kings in battle set the armies up for instability, for the monarchs had to ensure their own territories were not threatened during their absence. During the Third Crusade, both the German and French armies were forced to return home to settle succession disputes and stabilize their kingdoms. Furthermore, both the Second and Third Crusades were in response to European losses, first the fall of the Kingdom of Edessa and then the fall of Jerusalem to Saladin. These defensive expeditions could be seen as lacking the religious fervor and initiative of the First Crusade, which was entirely on the terms of the Christian armies. Finally, the Third Crusade resulted in a treaty that left Jerusalem under Muslim dominion but allowed Christians access for trading and pilgrimage. In the past two crusades, the result had been to conquer and massacre or retreat, with no compromise or middle ground achieved. Despite the agreement in the Third Crusade, the failure to overtake Jerusalem led to still another crusade soon after. Crusading became increasingly widespread in terms of geography and objectives during the 13th century and beyond, and crusades were aimed more at maintaining political and religious control over Europe than reclaiming the Holy Land. Crusader states: A number of mostly 12th- and 13th-century feudal states created by Western European crusaders in Asia Minor, Greece, and the Holy Land, and in the eastern Baltic area during the Northern Crusades. Great Schism: The break of communion between what are now the Eastern Orthodox and Catholic churches, which has lasted since the 11th century. Knights Templar: Among the wealthiest and most powerful of the Western Christian military orders; prominent actors in the Crusades. heretics: People who holds beliefs or theories that are strongly at variance with established beliefs or customs, especially those held by the Roman Catholic Church. The Crusades were a series of religious wars undertaken by the Latin church between the 11th and 15th centuries. Crusades were fought for many reasons: to capture Jerusalem, recapture Christian territory, or defend Christians in non-Christian lands; as a means of conflict resolution among Roman Catholics; for political or territorial advantage; and to combat paganism and heresy. The First Crusade arose after a call to arms in 1095 sermons by Pope Urban II. Urban urged military support for the Byzantine Empire and its Emperor, Alexios I, who needed reinforcements for his conflict with westward-migrating Turks in Anatolia. One of Urban’s main aims was to guarantee pilgrims access to the holy sites in the Holy Land that were under Muslim control. Urban’s wider strategy may have been to unite the eastern and western branches of Christendom, which had been divided since their split in 1054, and establish himself as head of the unified church. Regardless of the motivation, the response to Urban’s preaching by people of many different classes across Western Europe established the precedent for later crusades. As a result of the First Crusade, four primary Crusader states were created: the Kingdom of Jerusalem, the County of Edessa, the Principality of Antioch, and the County of Tripoli. On a popular level, the First Crusade unleashed a wave of impassioned, pious Catholic fury, which was expressed in the massacres of Jews that accompanied the Crusades and the violent treatment of the “schismatic” Orthodox Christians of the east. Under the papacies of Calixtus II, Honorius II, Eugenius III, and Innocent II, smaller-scale crusading continued around the Crusader states in the early 12th century. The Knights Templar were recognized, and grants of crusading indulgences to those who opposed papal enemies are seen by some historians as the beginning of politically motivated crusades. The loss of Edessa in 1144 to Imad ad-Din Zengi led to preaching for what subsequently became known as the Second Crusade. King Louis VII and Conrad III led armies from France and Germany to Jerusalem and Damascus without winning any major victories. Bernard of Clairvaux, who had encouraged the Second Crusade in his preachings, was upset with the violence and slaughter directed toward the Jewish population of the Rhineland. In 1187 Saladin united the enemies of the Crusader states, was victorious at the Battle of Hattin, and retook Jerusalem. According to Benedict of Peterborough, Pope Urban III died of deep sadness on October 19, 1187, upon hearing news of the defeat. His successor, Pope Gregory VIII, issued a papal bull that proposed a third crusade to recapture Jerusalem. This crusade failed to win control of Jerusalem from the Muslims, but did result in a treaty that allowed trading and pilgrimage there for Europeans. Crusading became increasingly widespread in terms of geography and objectives during the 13th century; crusades were aimed at maintaining political and religious control over Europe and beyond and were not exclusively focused on the Holy Land. In Northern Europe the Catholic church continued to battle peoples whom they considered pagans; Popes such as Celestine III, Innocent III, Honorius III, and Gregory IX preached crusade against the Livonians, Prussians, and Russians. In the early 13th century, Albert of Riga established Riga as the seat of the Bishopric of Riga and formed the Livonian Brothers of the Sword to convert the pagans to Catholicism and protect German commerce. Innocent III began preaching what became the Fourth Crusade in 1200 in France, England, and Germany, but primarily in France. The Fourth Crusade (1202–1204) was a Western European armed expedition originally intended to conquer Muslim-controlled Jerusalem by means of an invasion through Egypt. Instead, a sequence of events culminated in the Crusaders sacking the city of Constantinople, the capital of the Christian-controlled Byzantine Empire. The Fourth Crusade never came to within 1,000 miles of its objective of Jerusalem, instead conquering Byzantium twice before being routed by the Bulgars at Adrianople. In January 1203, en route to Jerusalem, the majority of the Crusader leadership entered into an agreement with the Byzantine prince Alexios Angelos to divert to Constantinople and restore his deposed father as emperor. The intention of the Crusaders was then to continue to the Holy Land with promised Byzantine financial and military assistance. On June 23, 1203, the main Crusader fleet reached Constantinople. Smaller contingents continued to Acre. In August 1203, following clashes outside Constantinople, Alexios Angelos was crowned co-emperor (as Alexios IV Angelos) with Crusader support. However, in January 1204, he was deposed by a popular uprising in Constantinople. The Western Crusaders were no longer able to receive their promised payments, and when Alexios was murdered on February 8, 1204, the Crusaders and Venetians decided on the outright conquest of Constantinople. In April 1204, they captured and brutally sacked the city and set up a new Latin Empire, as well as partitioned other Byzantine territories among themselves. Byzantine resistance based in unconquered sections of the empire such as Nicaea, Trebizond, and Epirus ultimately recovered Constantinople in 1261. The Fourth Crusade is considered to be one of the final acts in the Great Schism between the Eastern Orthodox Church and Roman Catholic Church, and a key turning point in the decline of the Byzantine Empire and Christianity in the Near East. Conquest of Constantinople: A Medieval painting of the Conquest of Constantinople by the Crusaders in 1204. After the failure of the Fourth Crusade to hold Constantinople or reach Jerusalem, Innocent III launched the first crusade against heretics, the Albigensian Crusade, against the Cathars in France and the County of Toulouse. Over the early decades of the century the Cathars were driven underground while the French monarchy asserted control over the region. Andrew II of Hungary waged the Bosnian Crusade against the Bosnian church, which was theologically Catholic but in long-term schism with the Roman Catholic Church. The conflict only ended with the Mongol invasion of Hungary in 1241. In the Iberian peninsula, Crusader privileges were given to those aiding the Templars, the Hospitallers, and the Iberian orders that merged with the Order of Calatrava and the Order of Santiago. The papacy declared frequent Iberian crusades, and from 1212 to 1265 the Christian kingdoms drove the Muslims back to the Emirate of Granada, which held out until 1492, when the Muslims and Jews were expelled from the peninsula. Around this time, popularity and energy for the Crusades declined. One factor in the decline was the disunity and conflict among Latin Christian interests in the eastern Mediterranean. Pope Martin IV compromised the papacy by supporting Charles of Anjou, and tarnished its spiritual luster with botched secular “crusades” against Sicily and Aragon. The collapse of the papacy’s moral authority and the rise of nationalism rang the death knell for crusading, ultimately leading to the Avignon Papacy and the Western Schism. The mainland Crusader states were extinguished with the fall of Tripoli in 1289 and the fall of Acre in 1291. Centuries later, during the middle of the 15th century, the Latin church tried to organize a new crusade aimed at restoring the Eastern Roman or Byzantine Empire, which was gradually being torn down by the advancing Ottoman Turks. The attempt failed, however, as the vast majority of Greek civilians and a growing part of their clergy refused to recognize and accept the short-lived near-union of the churches of East and West signed at the Council of Florence and Ferrara by the Ecumenical patriarch Joseph II of Constantinople. The Greek population, reacting to the Latin conquest, believed that the Byzantine civilization that revolved around the Orthodox faith would be more secure under Ottoman Islamic rule. Overall, religious-observant Greeks preferred to sacrifice their political freedom and political independence in order to preserve their faith’s traditions and rituals in separation from the Roman See. In the late-14th and early-15th centuries, “crusades” on a limited scale were organized by the kingdoms of Hungary, Poland, Wallachia, and Serbia. These were not the traditional expeditions aimed at the recovery of Jerusalem but rather defensive campaigns intended to prevent further expansion to the west by the Ottoman Empire.